While scholars have long looked at the role of political Islam in the Middle East, it has been assumed that domestic politics in the wealthy monarchical states of the Arabian Gulf, so-called “rentier states” where taxes are very low and oil wealth subsidizes the needs of citizens, are largely unaffected by such movements. However, the long accepted rentier theory has been shortsighted in overlooking the socio-political role played by Muslim Brotherhood affiliates in the super-rentiers of Kuwait, Qatar, and the United Arab Emirates. While rentier state theory assumes that citizens of such states will form opposition blocs only when their stake in rent income is threatened, this book demonstrates that ideology, rather than rent, have motivated the formation of independent Islamist movements in the wealthiest states of the region. In the monarchical systems of Qatar and the UAE, Islamist groups do not have the opportunity to compete for power and therefore cannot use the ballot box to gain popularity or influence political life, as they do elsewhere in the Middle East. But, as this book points out, the division between the social and political sectors is often blurred in the socially conservative states of the Gulf, as political actors operate through channels that are not institutionalized. Simply because politics is underinstitutionalized in such states does not mean that it is underdeveloped; the informal realm holds considerable political capital. As such, the book argues that Brotherhood movements have managed to use the links between the social (i.e. informal personal networks) and political (i.e. government institutions) to gain influence in policymaking in such states. 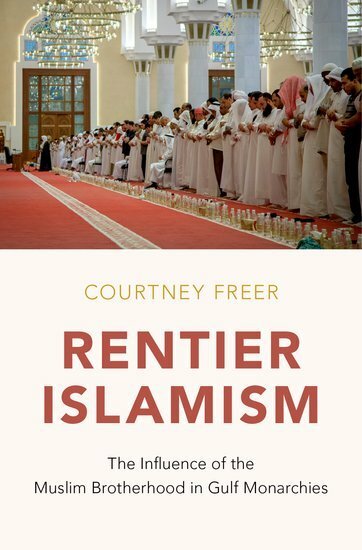 Using contemporary history and original empirical research, Courtney Freer updates traditional rentier state theory and argues that political Islam serves as a prominent voice and tool to promote more strictly political, and often populist or reformist, views supported by many Gulf citizens.